As another local calendar chess year is ending it is useful to remind us how popular and thriving chess has been in Dorset in 2017. We should all be immensely proud of what we have achieved and congratulate ourselves on a very successful year. March – The annual Dorset Rapidplay is now held in March each year at the Greyfriars Community Centre, Ringwood. It is efficiently organised by Mike Jay and Martin Simons is the controller It is now so popular and successful that, for this year’s event, it was ‘sold out’ in January 2017! There were great prizes and almost half of the players walked away with something, not to mention with full and contented stomachs. Some players were even overheard saying they only come each year for the FREE lunch, so much for the chess! Congratulations to Gabor Horvath (No Club) for winning this year’s competition whilst Allan Pleasants (Weymouth) and Oscar Garcia (Poole) played well to become the joint Dorset Rapidplay Chess Champions. 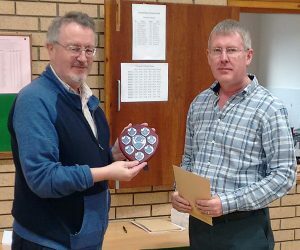 March & October – Bournemouth based Gabor Horvath (pictured left) had an especially good year, winning the Dorset Rapidplay in March as explained above, and then the Dorset Open Championship in October. He was unbeaten in both competitions. He does not currently belong to a club, but his chess activities include coaching and he is a member of Eric Sachs’s successful team running Saturday morning chess at Bournemouth Library for juniors, plus other events for junior chess players, particularly congresses. Gabor’s pre 1 Jan ’18 grade is 210, making him the highest graded player in Dorset. May – Wimborne A and Weymouth A are to be congratulated for winning the 1st Divisions of the B&DCL and Dorset League respectively for the 2016/17 season. However, Wimborne C in the Dorset League Division 3 was the only team to remain undefeated throughout the season across both leagues so well done to the Wimborne C players! May – Poole reminded us that they are one of the strongest clubs in the County by winning the B&DCL Team Handicap Knockout Cup beating a resilient Purbeck team in an exciting yet tense final 4-2. In a highly successful season they also won the Dorset League Division 2 and their B team won the B&DCL Division 2. June – There were two well attended and successful B&DCL and DCCA Annual General Meetings. These meetings always offer all members the opportunity to ask our league officers any questions, review the accounts, congratulate individual and team winners, whilst also discussing any rule changes and future plans. Many new B&DCL rules were successfully introduced including allowing for more flexibility in player allocations to and transfers between teams, at the same time maintaining each team’s core base of players. Summer – Due to the generosity of local players during the summer months, and at the initiative of Poole Chess club, Steve Bailey (pictured middle front row) will be financially supported to join a team of visually impaired cricket coaches in the West Indies in 2018. September – The start of the new 2017/18 season began with extremely high attendances at its two curtain raisers, firstly at the Dorchester Jamboree (pictured left) and secondly at the Two Towns Bournemouth v Poole match, the latter ending in a tight match and a hard fought 14-14 draw! The Dorchester Jamboree was also highly competitive, with Dorchester A, Yeovil and Purbeck all finishing on 3.5, but Purbeck were declared winners on lower grades. September – Against the backdrop of a very successful British Chess Championships, held for the first time for 80 years in Bournemouth in 2016 and which attracted record numbers, there has been some increase in overall numbers and interest in local chess. To accommodate this, a new additional 5th division in the B&DCL was added for the 2017/18 season, and there are also more teams in the Dorset League Division One. October – Mike Waddington (Dorchester), pictured left, became the new Dorset Chess Champion at the highly successful Dorset Open Championships held at the Elstead Hotel thanks largely to the organisational skills of Ian Clark, DCCA President, who at one stage had all the players, but no hotel playing venue! This was because the previous year’s Ocean View Hotel and first choice for this year, had to be closed at late notice! November – James Forster (Southbourne) became the overall Dorset Junior Chess Champion at the championships held at the excellent Bournemouth School for Girls venue where there was a well-supported turnout of 71 juniors. Other noteworthy winners included Under 16 – Ciaran Southey, Under 14 – Mickey Pritchard & Annelie Davis, Under 12 – Josh Leggatt & Nidhi Ramesh, Under 11 – Oscar Davis, Under 10 – Hugo Svedberg, Under 9 – Oliver Smith, Under 8 – Emilio Parandian. Congratulations to all Junior players and winners. December – Poole have made a great start in 2017/18 heading up both 1st Divisions of the B&DCL and Dorset Leagues. They are clearly the team to beat! 1. Many local players have been successful playing in the 4NCL (mainly for the Wessex team), at the British Chess Championships and on foreign soil. We even have the current Welsh Chess Champion hiding amongst us in Allan Pleasants (Weymouth)! 2. Junior Chess is now so successful that the Saturday morning slots of coaching and lectures at the Bournemouth Library (including a great Rapidplay held there on the 4th November) is being almost overrun by enthusiastic youngsters and is often bursting at the seams. Eric Sachs, Junior Chess Officer, and his team, has been pivotal in its success but he is now screaming from the hilltops for some more help! It looks as though Dorset Junior Chess is in safe hands, but we urgently need more. 3. There are enthusiastic chess clubs being held nearly every day of the week. These include the Pelhams Community Centre in Kinson on Mondays (1.45pm to 5pm), at the Ludo Lounge, Southbourne, on Tuesdays (2.30pm to 5pm) and at the Flirt Cafe Bar at the Triangle in Bournemouth on Wednesdays (2.30pm to 5pm). Those who cannot make the afternoons can drop in at the Royal British Legion, Wimborne, on Thursday mornings (from 10am) and at the Crooked Book, Boscombe, on Fridays (11am to 1pm). All these continue to thrive in friendly atmospheres. Please do call in for some relaxed games of chess. 1. We now have an excellent, very workable Dorset Chess website which has been expertly put together by Niki Buskell (Web Designer). Mike Jay (Webmaster) is responsible for content input. A lot of work and effort goes into maintaining this website, keeping it current (including falling snow at Christmas!) and nothing is too much trouble for them. Mike is so full of enthusiasm that this is rubbing off on others as he now has all captains obediently trained to submit league results immediately, so much so that these match results are often published on the website well before the matches are due to finish! This augurs very well for next season when, if ECF LMS is adopted we will have the option of captains entering results on the system themselves. 2. Phil Wallace (Grading Officer) has been working extremely hard taking the lead on the sometimes challenging, but new Phase 1 ECF LMS system. Apart from being our principal means of recording results for ECF grading, as Dorset, we are trialling the system for possible adoption next season. This is perhaps the most radical and progressive change in 2017 and also enables tables, plus much other data to be produced. To be relevant, progressive and current we need to think about how we can actively seek and look after new chess lifeblood into our clubs. There are probably two ways. Firstly, we need to continue to promote chess and support children in as many schools as possible across the whole of Dorset. Eric and his team have worked extremely hard in Bournemouth and surrounding areas, but they are keen for there to be an active Schools’ Co-ordinator across the west side of the county. Secondly, we should be mindful to promote and support new players who join our clubs. We were all there once ourselves, as keen but nervous beginners and probably with a playing strength of substantially less than 100. We therefore need to continue to welcome and support these aspiring individuals with open arms to ensure chess continues to thrive in our area. However, with over 300 adult and junior chess players across 10 clubs and several schools, Dorset is a great place to be seen playing chess and all this enthusiasm & collective spirit augurs well for 2018!